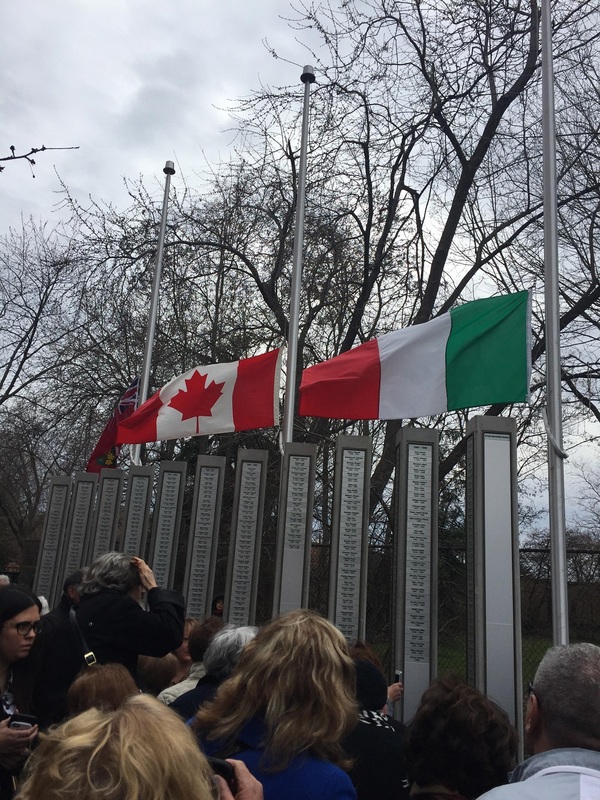 On April 28th, the National Day of Mourning for Workers Killed or Injured in the Workplace, organizers unveiled the Ontario Italian Fallen Workers Memorial at Columbus Centre in Toronto. A project more than six years in the making, the one-of-a-kind memorial is in honour and memory of almost 1,000 workers who’ve died at work in Ontario since 1900 – all of Italian heritage. 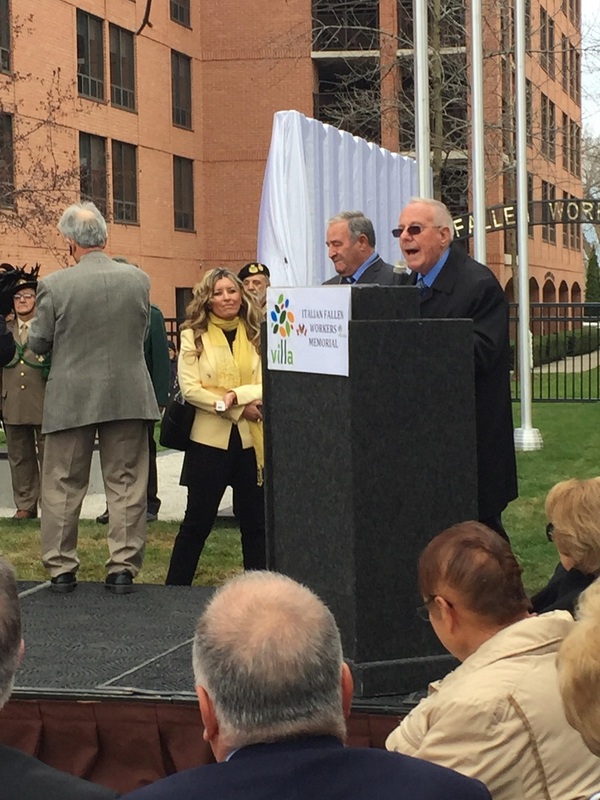 Organizer Marino Toppan contacted Threads of Life a few years ago, to see if we could help organizers reach families who may wish to submit their loved one’s name for the memorial. We reached out to our family members to share news of the project – through our newsletter, Threads, and on Facebook and Twitter – to invite families to contact Marino if they would like to have their family member’s name engraved on the monument. While organizers originally estimated 300 to 400 workers, nearly 1,000 names were submitted and verified before the unveiling on April 28, 2016. More names have been submitted in the days since, and organizers are currently accepting requests to have names added in 2017. As a representative of Threads of Life, Erin had the opportunity to speak to the attendees, including union leaders, politicians, ministers of parliament, the mayor of Toronto, and family members of the fallen workers. With over 400 people in attendance, Erin shared how Leo died, and also how she found support through Threads of Life. It is our hope that other families who are looking for support will reach out and contact Threads of Life. During the ceremony, a shroud of white silk was pulled back to reveal the memorial as a series of metal columns – each representing a decade since 1900. The names of the workers were etched on plaques with their Italian brothers and sisters who died on the job during the same decade. While all sectors are represented on the memorial, wreaths were laid to represent the Italian community’s heavy sacrifice in the construction, mining, and railway industries, as well as in emergency services. Various family members in attendance then participated in the “Laying of the Honour”, where a shovel, hammer, miner’s helmet, railway tie and spike were placed in front of the memorial. When Erin spoke, she shared her thoughts on one of the best ways we can honour the men and women named on the memorial – by helping to ensure all workplaces are safe, so no new names will need to be added in the future. 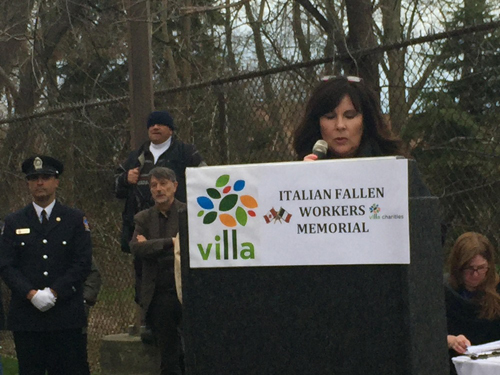 For more information, or to submit your family member’s name for addition to the Italian Fallen Workers Memorial, please visit www.ItalianFallenWorkersMemorial.com.